In this courtroom sketch, Maria Butina, left, is shown next to her attorney Robert Driscoll, before U.S. District Judge Tanya Chutkan, during a court hearing at the U.S. District Court in Washington, Dec. 13, 2018. The attorney for Maria Butina, the Russian women whom U.S. federal prosecutors have charged with illegal foreign lobbying, says her passport has been handed over to U.S. immigration officials to expedite her anticipated deportation to Russia. In an interview with Russia's state run TASS news agency, defense attorney Robert Driscoll said he hopes the U.S. judge hearing Butina's case will announce a verdict and sentencing date within two to six weeks of her next hearing, which is scheduled for February 26. "Our hope would be that she'll receive a sentence that will be equivalent to the time already served and that she will be released and deported soon after that," Driscoll is quoted as telling TASS reporters. FILE - Maria Butina appears in a police booking photograph released by the Alexandria Sheriff's Office in Alexandria, Virginia, Aug. 18, 2018. Even if Butina receives a time-served sentence, which would trigger her immediate release, Driscoll said he would still need to negotiate with U.S. Immigration and Customs Enforcement (ICE) officials to arrange for the deportation of a convicted felon. According to Butina's plea bargain with prosecutors, U.S. officials have the right to keep her in custody until she’s done cooperating. "We think she is done with cooperation now, but we need to make sure the government agrees with that," said Driscoll. "It depends on how long the government says they need, wherever there are any other cases that she needs to testify about. "I've been talking to them in advance, obviously, trying to make that transition as smooth as possible so that we don’t have her in ICE detention for any significant length of time," Driscoll said, adding that he's hopeful her transition from her Virginia jail to Russia can happen in less than a week. "We're working that out," he said. "ICE already has her [Butina’s] passport. We're trying to make sure this happens as quickly as possible," he continued. 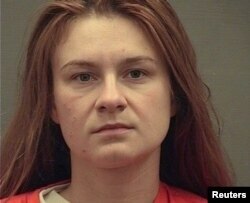 Butina, who in December pleaded guilty to conspiring to act as an unregistered Russian agent, had been held in solitary confinement for months. Driscoll also told interviewers that, after her December plea, she was moved to a minimum-security cell and has since had access to a gym, meals with other female inmates, a prison chapel, and gets to watch television shows once or twice a week. In January, Butina's family told VOA that they were eagerly awaiting her return to her hometown of Barnaul, Siberia. Driscoll said he's not sure whether Butina would return to Russia via commercial or government flight. Pete Cobus is VOA's acting Moscow correspondent.